iShares Dow Jones U.S. ETF (IYY) Shares Bought by Nottingham Advisors Inc.
Skyworks Solutions Inc (SWKS) Stake Raised by Pacer Advisors Inc. The New York Times Company (NYSE:NYT) is taking steps to reduce its employee headcount at the Times by offering buyouts to its newsroom employees. The buyouts are aimed primarily at editors, but reporters and others in the newsroom would also be free to apply. The number of positions targeted was not revealed. The plan was announced Wednesday in a memo to the newsroom. Dean Baquet, the executive editor, and Joseph Kahn, the managing editor, said in the memo that the two separate groups of “backfielders” and copy editors would be replaced with a single group of editors responsible for all aspects of a story. The memo said, “Our goal is to significantly shift the balance of editors to reporters at The Times, giving us more on-the-ground journalists developing original work than ever before.” If there are not enough volunteers for buyouts, The Times could turn to layoffs, according to Mr. Baquet and Mr. Kahn. One of the primary recommendations in an internal study issued in January, dubbed the 2020 Report, was reducing the layers of editing. Mr. Baquet and Mr. Kahn said that the savings would be used to hire as many as 100 more journalists. This means that the company will require more of the editors who remain. The Times is trying to modify its business into a more digitally focused newsroom. The company reported strong digital growth in May, capped with a 19 percent gain in digital advertising revenue. In the most recent quarter, The Times added 308,000 net digital-only subscribers, leading to an 11 percent jump in circulation revenue. It was the second consecutive quarter of record-breaking subscriber growth. The Times now counts more than 2.2 million digital-only subscribers on its rolls. However, the increase in digital was not enough to offset the decline in print advertising. Print advertising at The Times fell 18 percent in the most recent quarter, resulting in an overall advertising revenue decline of 7 percent. The New York Times has been forced to offer severance packages to many employees over the last five years, but this might be its most drastic cuts yet. 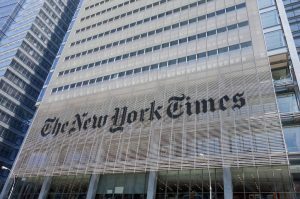 Arthur Sulzberger Jr., the publisher, said in a separate memo that The Times would be eliminating the position of public editor. The post was created to hold the paper accountable after the Jayson Blair plagiarism scandal in 2003. The current public editor, Liz Spayd, will leave The Times on Friday. NuWave Investment Management LLC Has $360,000 Position in Mohawk Industries, Inc.
NuWave Investment Management LLC Purchases 9,993 Shares of CenterPoint Energy, Inc.